The GMC CCKW 353 (40 mm Bofors) is a Rank III French self-propelled anti-aircraft gun with a battle rating of 3.0 (AB/RB/SB). It was introduced in Update 1.75 "La Résistance". Its main armament is a very potent Bofors cannon which can shred both tanks and planes if you manage to hit them properly. While armour is pretty nonexistent, it has good mobility, even for a truck-based SPAA. The CCKW 353 is a truck based SPAA mounting a single Bofors 40 mm in the back of the truck. The truck itself is an American-made GMC CCKW 353 2 1/2-ton 6x6 truck commonly known as the "Deuce and a half". All over this very long chassis, there is no armour to protect the only 3 crew members from incoming MG fire, artillery shells and HE rounds: if spotted, this Deuce and a half is very tempting target. Although, this very minimal protection also makes this vehicle quite resistant to long-range fire: poorly aimed rounds will only pass by without doing any spalling damage, leaving the crew intact. Viewed from the side, about half of this vehicle's silhouette is just thin air, use it to your advantage. With such little armour, APHE shells will also not be triggered, in that sense, they act as normal AP rounds, which greatly reduces their lethal potential. If your opponents got none of them, you are safe from a quick destruction. Speed and intelligent positioning actually are your principal source of protection. With its max speed of 70 km/h on road and ~25 km/h off-road, this chassis can carry its user to most good spots with ease. In order to reach your objectives in an optimal time, use covered roads to get in the general area and then go off-road to finish the trip. Contrary to tracked vehicles, a straight line is not the best route. As a wheeled chassis, it is strongly recommended to avoid sharp turns as they bleed off a good amount of speed and can leave you overturned. Keep your inertia. It is to be noted that mobility is very reduced on soft grounds (snow, sand, mud, etc.). Plan your moves when facing these kind of terrains as your speed is capped around ~18 km/h. Plan your escape routes: turning on the spot is a no way, when hiding, make sure not to face an obstacle. At this BR, the 40 mm cannon is very potent against most threats. Its penetration rates are comparable to the QF 2-pounder, which veterans of early British tanks will be familiar with. At BR 3.0, the QF 2-pounder is still equipped on the Churchill Mk I but the Bofors fires 120 shots/min with comparable penetration rates. Plus, reload rate is very fast, which makes switching ammo belts almost unnoticeable while firing. Most lightweight enemies you manage to flank will be taken out very fast. In order to be most lethal, target driver/engine first, then, the gunner and finish off the rest of the crew (make sure to fire at the gun's breech/turret ring in order to disable it to fire back even if gunner gets back up). As said before, this SPAA has pretty much no armor due to the fact this thing is pretty much a very large truck with a 40 mm Bofors gun bolted onto it. Luckily, with an SPAA with such a low profile, it's much easier to hide in foliage with it, especially if you are willing to pay some golden eagles in order to get some camo or bushes on it. Additionally, the 40 mm Bofors gun is great for self-defence. 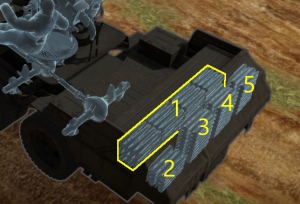 And you needn't worry about enemy tank shells coming at you, because if they hit, all shell types will pass straight through unless they hit something vital. Your biggest threat is enemy machine gun fire, but if you angle your tank so that it is ready to withdraw, this tank is pretty fast so you should be able to get out of there while returning fire. Default AP-T / HEFI-T* These work fine, a hit on an aircraft means certain disassembly for it and still is able to hurt ground vehicles, especially if it is side into the side of a enemy tank. These seem like a good "I don't know what I will run into" belt. Mk.II HEFI-T* These mean certain destruction for the targeted aircraft, what should be used for AA work. Ammo racks of the CCKW 353 AA. This specific truck plays similar to Russian and German truck-based SPAAs, where high caliber and slow fire rate are their mark of distinction. One can definitely use the CCKW as a front line AA, defending its teammates against enemy planes while remaining very potent at destroying tank. With its high reload speed, firing rate, and gun traverse, it can switch very quickly from one role to another. While not being the best SPAA nor the best TD, it surely is a very balanced deal between the two. First thing that should be noted is that unless you are solely using it at 3.0, the Deuce should never be taken out as a first spawn vehicle. Should the time arise that you are forced to take it or the enemy are using a large number of aircraft, this SPAA can be used for deleting aircraft and tanks alike. As with all SPAA, your first goal is to get the aircraft to either stall over the battlefield, or head you on. At that point it's up to you to liberate your allies from enemy aircraft. If as a player you feel like removing more land based targets the CCKW can be used in a pinch as a tank destroyer. 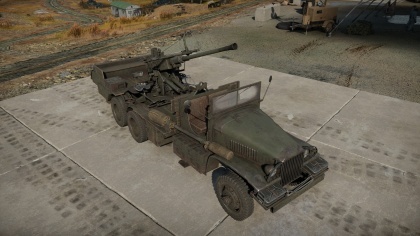 Thanks to it's good road based mobility and excellent pen of 76 mm at point blank (not to mention it's high fire rate and reload speed) this truck based tank destroyer can make an excellent ambush vehicle in both cities and more rural maps like Normandy, firing from semi-covered flanking positions. When near the front line, hide yourself behind an hill, a rock, a building, anything to hide completely this very long chassis. Staying behind cover, peek out to your surroundings and to the sky. If an enemy happens to pass by, spread it with 40 mm shells until it is destroyed. If you happen to hear a plane, engage an HE belt in the gun a point it to the skies. Make sure to aim every shot you make since your firing rate makes engaging planes a bit hard. Just firing in the general direction of the enemy will not score hits: aim. Plus, this truck is a very juicy targets to any planes: they will try a dive on you. These manoeuvres are great opportunities to score a direct hit to any strafing opponent. The faster you react to such moves, the higher your survival chances are. Bombers are quite fragile to such large shells. These are your priority targets, leave faster-moving planes to faster-firing allies (Wirbelwinds & Co.). 40 mm Bofors at 3.0. It has good anti-tank capability. Very vulnerable to large HE shells, MG/HMG/autocanon fire and artillery barrages. Nicknamed the “Deuce-and-a-half” by the U.S. army, the American 2.5 ton triple-axle 6x6 made by GMC is a true army workhorse. GMC trucks were vital to supplying and equipping allies after land operations began in Europe, and more than 560 thousand of these trucks were produced during World War II. They proved invaluable to supply lines and the battlefield. The GMC CCKW 353 was a combat model of the famous truck equipped with a 40mm anti-aircraft gun and used by the French in WWII. Various allied armies other than the US used the reliable GMC trucks. France adopted a variant of the 1941 model with a simplified cabin design and longer chassis—the military all-wheel-drive (6x6) GMC CCKW 353. 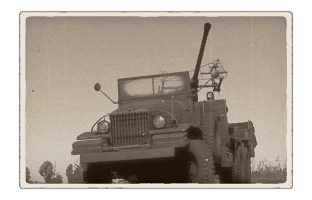 Equipped with a 40mm Bofors cannon (very familiar to War Thunder naval warfare testers), the GMC vehicle was transformed into a mobile anti-air defense platform that could also be used against ground targets, such as enemy infantry, lightly armored vehicles, and fortifications. [Devblog] GMC CCKW 353: A deuce-and-a-half. And a gun.